© Awakener magazines copyright Universal Spiritual League in America Inc. Used by permission. 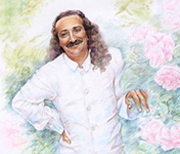 All quotes by Meher Baba, Mehera Irani, Mani Irani, Eruch Jessawala, Adi K. Irani in The Awakener magazines copyright Avatar Meher Baba Perpetual Public Charitable Trust. Used by permission. Photos copyright by Avatar Meher Baba Perpetual Public Charitable Trust, MSI Collection, and others were used with permission and may not be copied. Painting on this page copyrighted Diane Cobb.